I do not wish to perpetuate the Mommy Wars that are said to passively-aggressively exist between work-outside-the-home moms and stay-at-home moms. In my experience, moms usually respect each other's choices and unique situations. I believe in women encouraging each other-- not tearing each other down. BUT... I want to air out a bit of dirty laundry instead of letting it fester and multiply in my brain. I have noticed a frustrating trend, that is [hopefully unwittingly] insulting towards stay-at-home mothers like me. Several times, women who work outside the home have felt the need to inform me how expensive daycare is. They might even add the cringe-worthy "you are SO lucky not to have pay for it." I have made imprints in my tongue, biting it so hard, so as not to ruffle feathers or appear ungrateful (ingratitude being the worst offense a SAHM can make) and reply with a snarky, "Guess what? Staying at home and giving up an entire salary is SO expensive too!" Our family just "pays for it" in a completely different way. How is this crucial fact so often ignored? Sure, there is probably 2% of the population where a family lives in a life of luxury regardless of the job situation, but for the majority of us, having kids affects our lifestyle in extreme ways. So here it is, a clarification I would like to offer: Having children is expensive either way. If you are fortunate enough to be a two-parent household, then you can either go down to one income and tighten your belts across the board, OR you can both work, pay daycare to watch your kids, and again, tighten your belts across the freaking board. What also nags at me is what might be the underlying belief here: Do the mothers who inform me that daycare is expensive think I'm stupid? Truly, is that part of it? The whole "she must not be very smart if she is willing to stay home and change diapers all day." They feel it is their duty to patiently explain to me the costs of raising children in the modern world? Me no understand. Most mothers do their research. With actual brains. Like thousands of other SAHM's, when I was pregnant, I contemplated staying in my career versus staying home with children. We ran the numbers. We discussed it often. We chose the option that made the most sense for our family. See, we have brains, and we even use them! 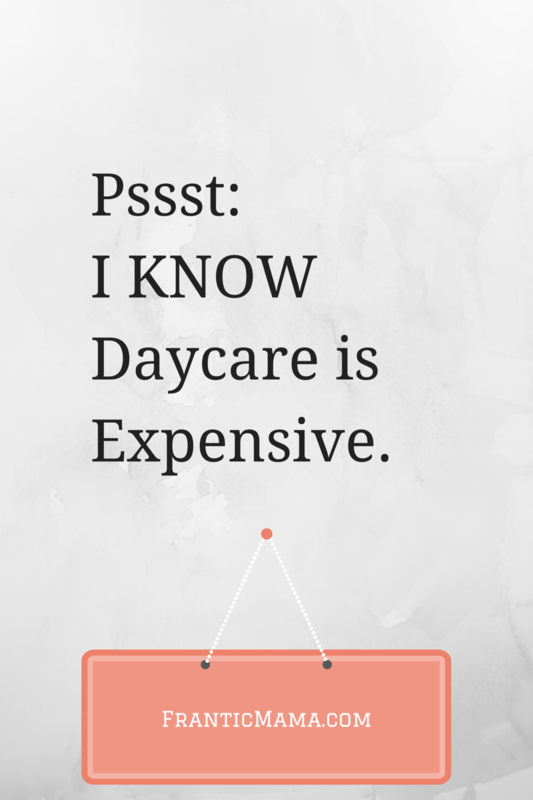 Have you been the lecturer informing a simple homemaker all about the cost of daycare? Then I would like to remind you of this: your friend who stays home with the kids? She's not dumb. She knows childcare is expensive. Priceless even. She does it every single day. P.S. My blog address has changed from www.FranticMama.blogspot.com to www.FranticMama.com! *Let's connect: Facebook, Twitter, Instagram, & Pinterest. Thanks so much for reading and supporting this post, Dakota. It was a labor of love, for sure. I worked on it for a long time to try to get the tone as accurate as I could (to reflect how I feel about it without being sarcastic or caustic). I wonder now, what I have been doing right f... Maybe it's that I occasionally swap out my contacts for glasses, to make me look so smart? I have yet to encounter anyone who feels the need to point out how pricey childcare is. Honestly, I don't have too many opportunities to hang out with women whose lifestyles are vastly different from my own, as I met most of my friends with kids after having them, and most of us built our friendships over playdates, as we all stayed home and/or worked part time. My full-time working mom friends are my old friends and we know each other well enough and respect each other enough to understand that all of our lives are complicated, just in different ways. PS "Me No Understand" made me laugh. You are clearly doing a lot right :). I have the most in common at this point with other moms who stay home full or part-time, though I do have a few friends who work outside the home full-time. The diciest relationships for me are those where the other person always sees the grass as greener [on the SAHM side of the fence].